A blonde was going on a plane trip to New York. When the attendant came by and asked for her ticket, she told the blonde,"I'm sorry. Your ticket isn't for first class. Could you please move to your seat." The blonde replied,"Im blonde, I'm beautiful, and I'm going to New York." The attendant said,"That's fine miss, but you'll have to go to your seat." The blonde responded again, "I'm blonde, I'm beautiful, and I'm going to New York." This conversation continued, always with the blonde's same response. The attendant got so upset that she went to the captain and told him about the blonde. The captain went and whispered something in the blonde's ear and the blonde immeadiately got up and went to her seat in coach. 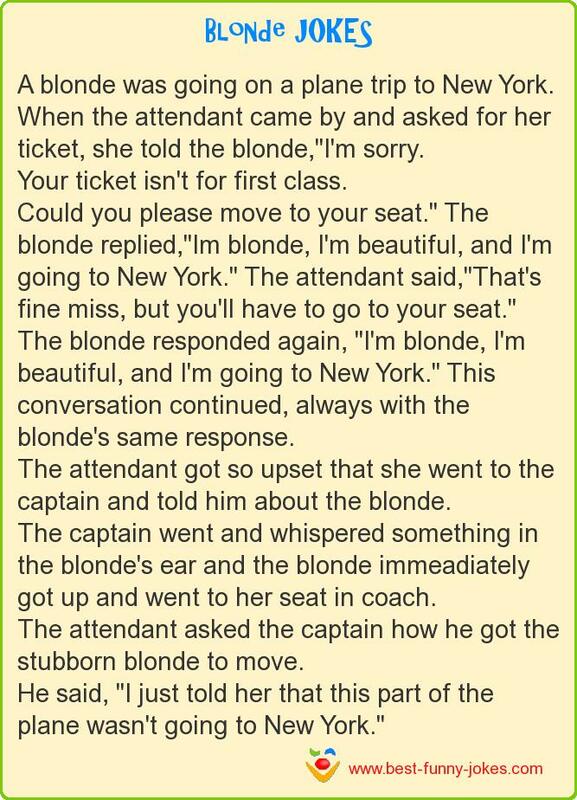 The attendant asked the captain how he got the stubborn blonde to move. He said, "I just told her that this part of the plane wasn't going to New York."